The word dendrite means tree-like, and in the case of snow crystals the term refers to branching and sidebranching. For example, the fernlike stellar dendrite snow crystal on the left exhibits a kind of dendritic sidebranching one often sees in snow crystals. 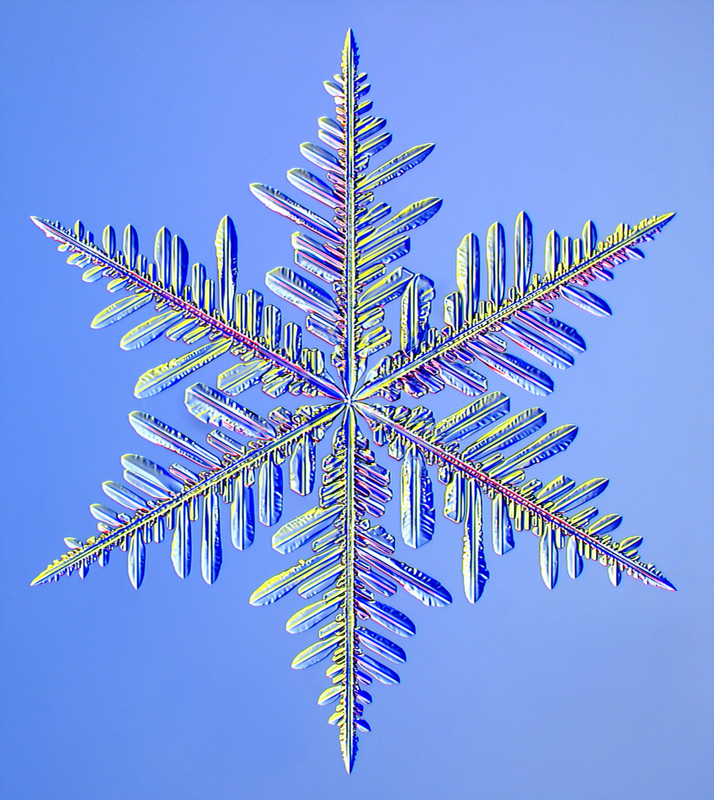 (For more about stellar dendrites, see the Guide to Snowflakes). Ice dendrites also appear as somewhat independent entities. The image on the right shows several dendritic branches growing at -15 C (5 F) in a diffusion chamber at high humidity. This phenomenon is called free dendrite growth, and quite a bit of scientific research has gone into understanding how these structures appear spontaneously during diffusion-limited crystal growth. 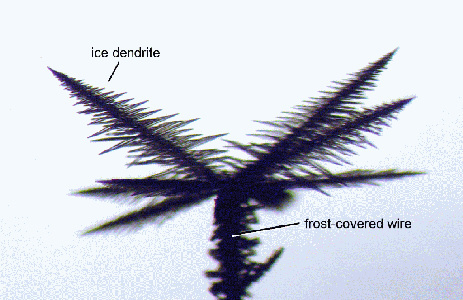 But this isn't the only kind of dendritic structure seen in snow crystals. Fishbones are another. The photo on the left shows a cluster of fishbone dendrites growing out from a wire. These were also found growing in a diffusion chamber at high humidity, but this time at a temperature of -5 C (23 F). If you click on the picture and examine it closely, you will see that the spiny sidebranches are coming out at rather odd angles. The -15 C dendrites have long been seen in fernlike stellar dendrites (again, see the Guide to Snowflakes), but the -5 C dendrites were only identified recently. 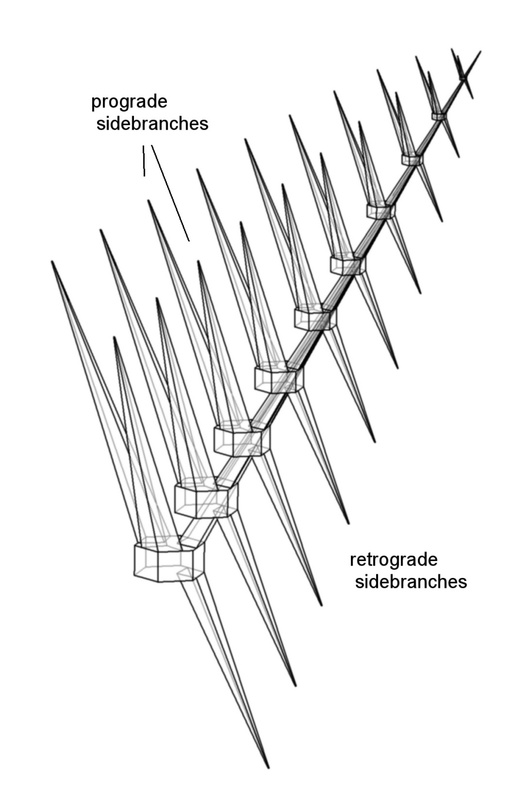 The image on the far right shows a single fishbone branch, and the nearer image shows a sketch of the structure. The hexagonal prisms were added to the sketch to indicate the ice crystal axes. 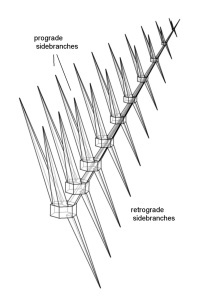 Computer models of faceted crystal growth have reproduced the -15 C dendrites, but not yet fishbones. You can find more information about the fishbone crystals here. Our goal with these studies is to better understand how ice crystals grow, and, by extension, how all crystals grow. You can read more about our scientific motivations at What's it good for? 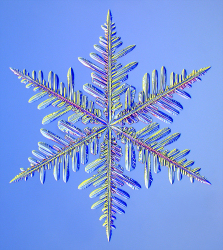 Here is another example of a complex snow crystal shape we see in the snowflake lab. This crystal grew at -7 C at the end of an electric needle. The SolidWorks drawing (center) shows the different parts of the crystal -- a hexagonal cup-shaped crystal with thin walls and six side extensions, all sitting on top of a solid hexagonal ice needle. A remaining scientific challenge is to understand ice crystal growth well enough to explain and model all the different morphologies that appear at different temperatures and supersaturations. This crystal grew at -10 C, and it is related to the one above. Instead of a hexagonal cup, this one is more of a concave hexagonal plate. It has the same extensions growing down from the corners of the plate, but this time some "I-beam" structures appear under the plate.